My Beauty Diary: Losing Followers? A friend of mine, who happen to be a blogger, made a post on her FB about this sudden lost. She tought it was because she made a blog post about her winning trip to Japan, so some people maybe think she's bragging too much. But, turns out there are many people left comments on her post and said they also lost their GFC followers as well. Some of them explained, that Google is doing some sweeping for those who follow blogs using Twitter/FB account. They persuade people to use google/blogger account to follow blog, that's why those who follow my blog with twitter/FB accounts are removed. "As part of this plan, starting the week of January 11, we’ll remove the ability for people with Twitter, Yahoo, Orkut or other OpenId providers to sign in to Google Friend Connect and follow blogs. 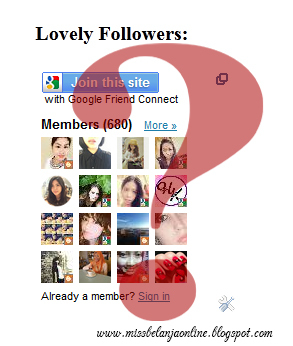 At the same time, we’ll remove non-Google Account profiles so you may see a decrease in your blog follower count." Now that I know the real reason behind the sudden change number of followers, I feel more at ease. Well, at least you don't leave this blog because you bored with it, right? But, I think it's also quite pity for me. Losing followers are easy but gaining one is quite hard. Those followers are the one who stay with me for these past 5 years. So, in my perspective, it isn't quite fair to remove them just because they don't have google account. After all, this blog is open for public, not only for fellow bloggers friend. But, in the end I don't have any right to complaint hehehe. All I can do is encourage you all to sign-up on blogger and follow blogs that you like to read. By signing up you will have a blog account, and you can use it even when you don't write anything on your blog. Have you encounter the same problem with your blog? Same here, I didn't even care to count followers. bebbii.. I miss you~ iya awal tahun ini mood ngeblog balik lagi dan sekarang mencoba aktif lagi update blognya..
Iya shel..ternyata memang dari sistemnya yang ada pembaharuan.. Thanks, this is really helpful. I noticed my follower count drop drastically over the past couple of days and tried Googling it to see if it was a GFC issue - and yours is one of only a couple of posts I've found explaining what happened. Like you, I feel much better now I know it's not just a bunch of people deserting me, especially since I've only just come back to my blog after a year away! 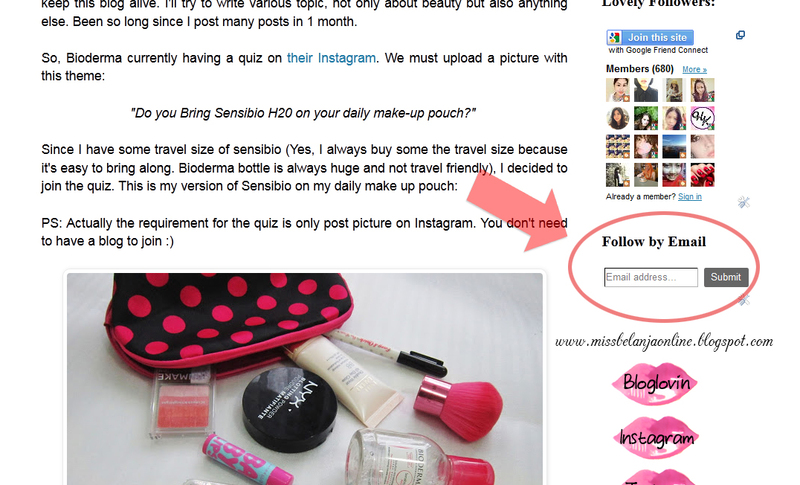 Hi, glad I can help with this post :) keep up blogging! Iya Shashaaa,,, Followers ku juga ilang banyak banget lumayan signifikan huhuhu Pas baca post ini aku cek followers ku ternyata bener ilang lumayan banyak :( But there's nothing we can do about it yaa..
hahaha iya van, aku juga sempet parno sendiri pertama-tama, biasanya kalau ada yg unfollow cuman 1-2 aja, ini mendadak banyak banget jadi agak2 shock hehehe..
makasih udah mampir def..glad I can help with this post :) aku juga sempat bingung pertamanya..
aku kira gara-gara aku kurang aktif ngeblog..
Iya.. banyak yang pada bingung juga, aku malah mikirnya karena terlalu aktif jadi spamming trus diunfollow hehehe..